Looking like a pair of eyeglasses only a rock star would wear, this nebula brings into focus a murky region of star formation. NASA's Spitzer Space Telescope exposes the depths of this dusty nebula with its infrared vision, showing stellar infants that are lost behind dark clouds when viewed in visible light in this cool space wallpaper. 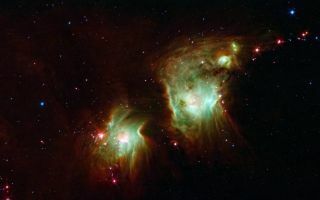 Best known as Messier 78, the two round greenish nebulae are actually cavities carved out of the surrounding dark dust clouds. The extended dust is mostly dark, even to Spitzer's view, but the edges show up in mid-wavelength infrared light as glowing, red frames surrounding the bright interiors. Messier 78 is easily seen in small telescopes in the constellation of Orion, just to the northeast of Orion's belt, but looks strikingly different, with dominant, dark swaths of dust. Spitzer's infrared eyes penetrate this dust, revealing the glowing interior of the nebulae.